Duško looks up at the hill behind his house. On 15th September 1995, when Vozuća in the adjacent valley fell, he abandoned all his belongings and became a refugee. 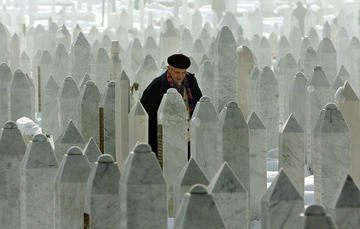 Over two million people, during the war in Bosnia Herzegovina (BiH), from 1992 to 1995, suffered the same fate. Twenty years after the beginning of that conflict, no-one knows exactly how many of them have gone back home. Duško's house, like most of the houses in his village, Bočinje, close to Maglaj, had been occupied by a family of mujaheddin, foreign volunteers who had fought alongside Bosnian muslims in central Bosnia during the war. Bočinje is a village in rural Bosnia which, before the war, had about 4,000 inhabitants. If one considers the recent history of this local community and the fact that almost all its dwellings were destroyed, some in 1995 and the rest in 2001, when the mujaheddin left, the return process here can be deemed a success. Houses have been rebuilt in groups of 10 or 20, depending on the possibilities of the organizations involved in the reconstruction. 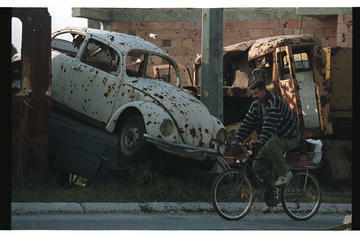 As elsewhere in Bosnia, the funds were insufficient for repairing all the damage. Most people, however, have been able to come back, their property has been given back to them and, according to the residents, there are no more problems of security. 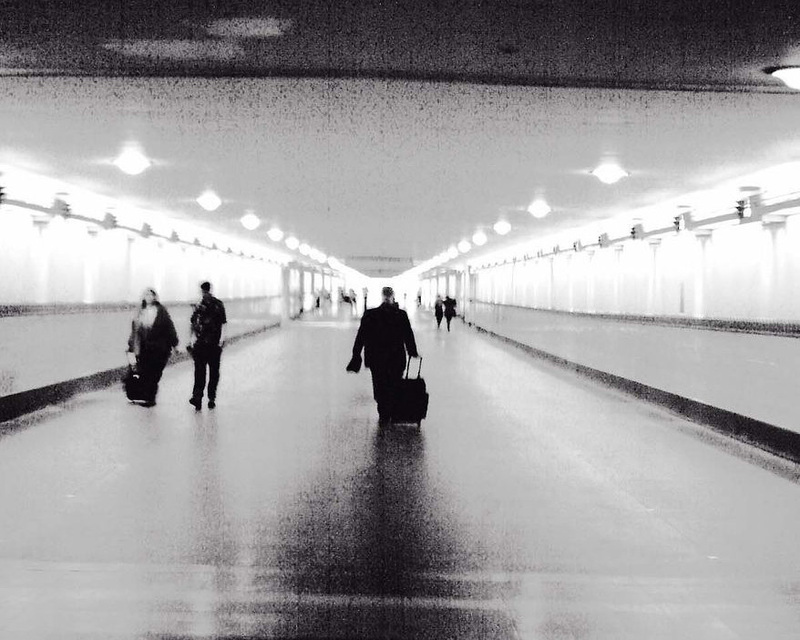 Even so, many of those who came back have left again. Today little more than 600 people live in the local community of Bočinje – less than a quarter of the original inhabitants. A few kilometres north of Bočinje, along the course of the river Bosna, one enters in Republika Srpska. One of the first villages encountered by the river, after Doboj, is Kotorsko. Before the war, the village of Kotorsko was completely Bosniak (Bosnian muslim). It still is today, despite now being within an entity with a Serb majority. Twenty years ago though, at the beginning of the war, the Bosnian muslims of Kotorsko were forced to flee. The speed with which ethnic cleansing went ahead in Bosnia, in particular in Republika Srpska, at the start of the war, has recently been evoked at the trial of the former Bosnian Serb leader Radovan Karadžić by a demographic expert, Ewa Tabeau, a witness for the prosecution. Tabeau says that around 300,000 Bosnian muslims had to leave their homes in the very first months of 1992, and in some districts, for example Prijedor, their number fell by 97% between 1992 and 1997, while the Serb population increased by over 100%. Muhamed's village, Kotorsko, was also occupied by Serbs, and Bosnian muslims were only able to return in the year 2000. Part of the village was destroyed and a part was still occupied. International donations have not been enough to rebuild everyone's houses. Some, especially those who fled abroad, have had to manage by themselves. But, in spite of the difficulties, the story of Kotorsko seems to be one of success. All properties have been handed back and return is a reality. At the foot of the hill on which Kotorsko stands, on the bend in the great river which gives the country its name, the Bosna, there's a clearing. Here an agglomeration of houses has grown up without a proper layout – no infrastructure apart from a gravel road and the odd electricity pole. Not everyone has water and the sewage system is non existent. Its inhabitants call it Trnovo Polje 1. These are on the whole Serbs who had occupied the Bosniaks' houses in Kotorsko and who, after those houses had been given back, either didn't wish or weren't able to go back to where they lived before the war. For some years Simo occupied the property of a Bosnian muslim woman in Kotorsko. When she came back from Germany, where she had fled during the war, Simo crossed the road and built a shack at Trnovo Polje 1. With time, and not without contention, that shack, along with numerous others, acquired walls, and a temporary solution has become permanent. Back in the Federation, the part of the country with a Croat-Bosniak majority, we meet another group of returnees in Zeleče, in the district of Žepče. Živko, a Serb, complains of the complete lack of work. A Bosniak neighbour confirms that many returnees, after coming back, sold their houses and went away again. In the long post war period in Bosnia, refugees have taken different routes: some decided not to come back, staying abroad or in other parts of the country; others, however, tried to go home. But often the latter did not find what they expected and left again, setting off a second wave of migration after the one of the 90s. The effects of this second exodus have not yet been evaluated. Mario Nenadić, civil servant at the Ministry for Human Rights and Refugees in Bosnia Herzegovina, at present assistant to the Minister, has followed the return process from the beginning. Approximately one million, according to the Ministry, is the number of people who fled abroad. Slightly larger is the number of internally displaced, taking refuge in areas where their nationality was in the majority. The Government data, in the Spring of 2012, show that of these 2,200,000 people, 1,070,000 returned to their own homes. The families on the waiting list for the reconstruction of their own house number 47,000. Lastly the people in Bosnia Herzegovina who still have 'displaced' status are 113,000. In 2010 the Ministry published a document entitled “Revised Strategy of Bosnia and Herzegovina for the Implementation of Annex VII Of the Dayton Peace Agreement”, the part of the Peace Accords which established the right of all refugees to return to their pre war homes. The strategy fixes 2014 as the date within which the right to return is guaranteed to those still wishing to do so. By the same date issues of compensation still pending for those with property destroyed will have to be resolved. A series of additional components including health, education, work, mine clearing and infrastructures complete the document. The process of returning properties has not, however, been painless. Often someone who occupied a house and didn't want to or couldn't go back to their own, was transferred to temporary lodging, to leave space for the legitimate owner. These temporary lodgings meanwhile became permanent and today in Bosnia Herzegovina more than 8,000 people still live in small or medium sized collective centres. Many of them are victims of evictions which took place when properties were returned to their previous owners. Not all countries in the region have dealt with the issue of property rights in the same way, moreover. Croatia, for instance, unlike Bosnia Herzegovina, denied refugees the right to take back their houses if they were socially owned apartments, a form of property quite common in socialist Yugoslavia. Consequently in Bosnia, and particularly in Republika Srpska, today there are still about 7,000 refugees from Croatia, especially from the Krajna region, who cannot get back the houses they lived in before the war. Many of them are in temporary lodgings or collective centers (1). A short distance from the Bosnian seat of government, on the other side of the Zmaja od Bosne, are the UNHCR offices. This is the organization to which Dayton assigned the task of supervising the return of refugees and displaced persons. The UNHCR estimates it has spent around 800 million dollars fulfilling its role in Bosnia. The amount spent on supporting the process of return is, however, certainly greater. No-one has a complete picture of the situation though, given that funding has often taken bilateral forms through States or various international organizations, governmental and not. Scott Pohl, Senior Protection Officer at UNHCR in Bosnia Herzegovina, substantially confirms the figures on return supplied by the Ministry. But, according to UNHCR, the million plus returnees could be subdivided into 550,000 who returned to areas where their nationality has the majority and 450,000 who went back to where today they are in a minority. The next census, scheduled for April next year after long discussions between the main political parties of the country, could bring some surprises. The returnees, according to official figures, are a little over a million. If only half of these, 550,000, have really returned, Bosnia Herzegovina, which in 1991 had a population of 4,300,000 and had 100,000 losses in the war, risks discovering itself a depopulated country. Moreover, if the only effective returnees are those in majority areas, the census could give a photograph of a Bosnia officially divided in three ethnically homogeneous zones: one Serb, one Croat and one Bosniak. One of the main aims of the nationalists during the war was to move people from one side of the country to another, using terrorism and ethnic cleansing. After the war, the aim became stopping the return of minorities and keeping evacuees where they were if they belonged to the majority in that place. Despite Dayton, and the widespread efforts of the international community, in Bosnia the nationalists seem to have won both the war and post-war. Some politicians, according to Vera Jovanović, had a determining role in making the process of return fail in the years immediately following the signature of the Peace Agreement. “I remember in 1996 Momčilo Krajišnik (then Serb representative in the Bosnian Presidential Office) organizing the transfer of the Sarajevo Serbs, convincing them even to move their cemeteries, explaining to them that it was not possible to continue to live there. He would walk round Ilidža and Vogošća (quarters of Sarajevo, editor's note) getting them to leave the city. After the war, all over Bosnia religious and national symbols were used, in particular crosses and flags, churches and mosques, to mark out territory and indicate allegiances. In some cases important public works programmes were launched, in particular house building, to allow the evacuees to stay where they were in the majority, creating sorts of colonies. Leaving Sarajevo from Grbavica, after crossing the Vraca Park with its monuments to WWII partisans, one enters the municipality of Istočno Novo Sarajevo, in Republika Srpska. The Vice President of the Municipal Council, Vojislav Milinkovič, reminds us that even recently 2,500 new homes have been built for the Serbs of Sarajevo. In the Bosnian capital, according to UNHCR, almost 33,000 properties have been returned, about 90% of those which were occupied. But no exact figures are available for the number of returnees to the city. A frequent comment is that the capital of Bosnia Herzegovina would now be an almost completely Bosniak city. In an apartment in Marijin Dvor, however, not far from the city centre, we meet a lady of Serb nationality who contradicts the general picture, telling us her story. 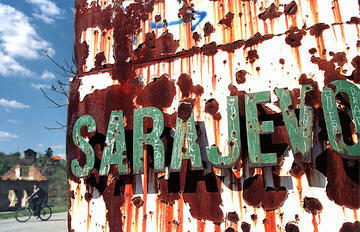 Twenty years after the beginning of the war, Bosnia Herzegovina is a strange country. On the one hand the Dayton Peace Agreement has certified the ethnic divisions in every aspect of political and social life. On the other hand, Dayton has tried to reconstruct the demographic situation which existed before the war and recreate what Bosnia always represented for European history: union in diversity. That task, however, seems far from being fulfilled. This would be a reason for a new political class, capable of reforming the Constitution, and for a new society. Science fiction in the present Bosnian and European climate. For the moment we have the example of who chose to return, people who have shown an extraordinary courage, as well as great devotion to their land. People like Varja, Muhamed and Duško. Next year, with the first census of the population since the end of the war, we will know how many made the same choice. What Bosnia Herzegovina will look like in the future, largely depends on them. (1) A donors' conference in Sarajevo at the end of April has however set off a positive regional process which involves, besides Bosnia Herzegovina, Croatia, Serbia and Montenegro. These 4 countries signed a Ministerial agreement which should allow assistance to 70,000 refugees, thanks to funds of 265 million euro, given mostly by the European Union, to help at least the most vulnerable cases, starting from this Autumn.